HOw do you ever say thank you enough to such great family and friends. 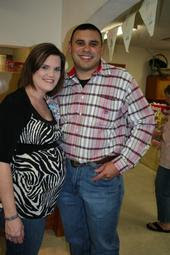 They gave us a wonderful shower and tons of baby gifts. The hosts of the shower gave us our two double strollers and all four car seats!!!!!!! They also had all men bring diapers, so we ended up with tons of diapers. I say tons, I am not sure what tons of diapers is when you are having QUADS. We are so greatful to everyone and everything they did and gave us. We are so blessed.